Exploring Constitutional and Administrative Law is the only academic text that addresses head-on some of the issues many students have with the subject, by using engaging features that are both accessible and rigorous. Contemporary case studies engage the reader by highlighting the legal relevance of each topic, before the black letter law, surrounding academic debate and wider political and economic context are introduced. 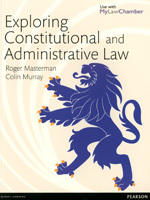 This text is eminently suitable for all undergraduate courses on Constitutional and Administrative Law. 11. The UK Supreme Court and Office of Lord Chancellor: Towards an Independent Judicial Branch?